A man who attacked his pregnant partner with a rolling pin has been jailed for more than a year. 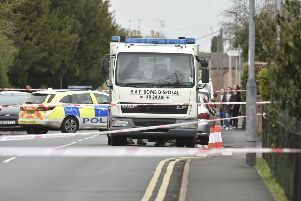 Michael Medcalf, 50, began arguing with the victim at their home in Millfield Place, Wilburton, in the early hours of 29 April after returning from a gathering with friends. Medcalf then attacked the woman, who is in her 30s, by strangling her and biting her cheek. He went on to hit her on the shoulder with the rolling pin, prod her in the stomach with it and then threw her Jack Russell dog out of the front door of the property. Yesterday (4 July) at Cambridge Crown Court he was sentenced to a year and eight months in prison, having pleaded guilty at a previous hearing. A restraining order was also put in place and he was ordered to pay a £140 victim surcharge.